Again, shoutout to our boys at YGO Scope for providing such a sophisticated tool. I’ve spent the last week working with the boys at ygoscope, to help refine their tool. Too often, things like ‘frog’. ‘paleo frog’, ‘sky striker frog’, ‘sky striker paleo’, ‘paleozoic’, etc were dividing up the results, and a lot of the time, the one thats just frog, is paleo frog that just didn’t draw his paleozoic stuff. Last week I manually compiled it all together, but some still slip through the cracks. We took a weekend to re-define how each deck is decided, and updated the tool a lot for this week. It does mean some of the earlier data doesn’t use the new setup, so the fruits of this labour will be much clearer next week, but we’ll still take a look. Let’s start with Decks. Starting us off this week is another tcg archetype deck that won’t seem to die. 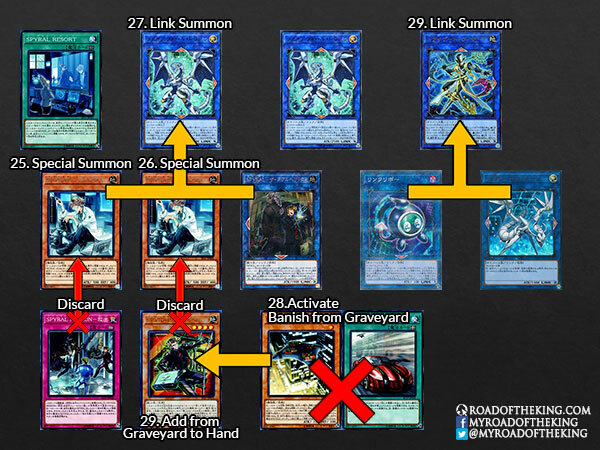 With big thanks to Knightmare Unicorn both discarding rescue and putting resort back in the deck, Spyrals returned to their former power, and frequently synergize with gouki’s motif of extra linking Knightmare monsters. Many players even still ran gouki’s, though that’s been getting rarer as people realize the SPYRAL engine in the deck was just stronger. Still rocking the Naturia Beast and True King cards of an era long-gone, this deck got some nice help in Cybernetic Horizon, and with such a few number of people playing the deck, it had much fewer mirror matches than other top decks (which drag a winrate closer to 50%, for better, or worse). Just like last week, it’s barely behind dinosaurs just due to how many mirror matches drag it down towards 50. Now overtaking gouki as the most played deck, it will have had the most mirror matches. Nothing surprising here, but what’s fascinating is how close its sister is to it. You read these numbers right. These decks are at this point identical in success. It helps that there is no time limits in online play. This deck has taken a bit of a fall. It’s actually only a fall of about 1-2%, but everything else jumped back up as people had new bad decks to try this week. Still playing almost no mirror matches as well. This is still a very real threat this format that people still just aren’t taking seriously. One more week. Just one more week. Like Dinosaurs, but with mirror matches. There’s nothing really to be said. Dig fast. Floodgate often. You win worlds one time and suddenly you’re the 2nd most played deck in the game. Again I’ve seen 3 replays just from the ones I watched where somebody used reincarnation + droll on the opponents draw phase, without them playing a card, and the opponent being okay with it. This does not work. You cannot do this. Stop doing this. You require them to have added a card first (or a 2nd reincarnation to add 5 for them). This deck is just nuts. A few people have started to tech Clara to play around their rivalries, but opponents are starting to play around things like typhoon more often to severely inhibit the success rate of this deck. It’s still a crazy deck. Most of the losses had one thing in common: Traps that responded to summons like bottomless trap hole or Torrential Tribute. The representation is steadily declining, but those sticking to this deck are seeing above average success with it. I think this is a good deck to play with for a few days to fully understand it, and prepare for the upcoming support its getting in the near future. I really am a fan of the play that makes beatrice turn 1 to dump snow and set up the cir dante loop. It’s crazy to me how consistently well that has been working for months now. A pure Mekk-knight deck using the field spell to nuke boards, the new link monster, and a bigger focus on the column traps. World Legacy’s Secret is one of the games most under-rated cards. Another deck using the sky striker engine, and primarily fueled by void feasts almost assured victory upon resolution. It’s very disruptive of opposing graveyards which helps this deck win. It doesn’t go 2nd well enough to be a top contending deck. This wasn’t last place this week. Still yet to see it win without getting lucky. Its record for this week was 11 and 8. I guess the outer entity nyarla is supposed to make this deck become better, but it’s already good. Better than these results represent. A rise in the use of Ghost Belle, and the general oppressiveness of altergeists; who get more popular every week, has been rough for these mechanical dragons. Win with Dark Law. Lose without Dark Law. Only 1 guy played this deck. He played it 7 times. He lost 4 of them. I’m only going to be doing top 5 decks from now on so the data is more clearly presentable. We have one deck sticking out as most used, and then 3 decks that are all very similarly used. Huge thanks and shoutout to our friends at http://www.ygoscope.com for compiling such valuable information!